If you have any questions you can fill out the form at the bottom of each page or you may contact me directly by phone at 336-345-1377. Please make sure and reference the tack you are asking about in your email. Tack is available to be shipped or you may come to the farm. Please make sure you add the shipping to your shopping cart when checking out. Shipping can be combined if buying more than one item. I hope you find something that you can use. All tack is used unless specified as new. 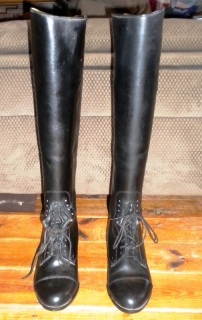 Used EXCELLENT Condition Ariat Field Boots Tall/Regular Calf. Worn twice sole not worn sole, ankle has almost no break down. Stored with boot jacks (not included). Pull on style. Additional pictures below. Shipping available for additional charge of $10.00. Click the Shipping Add to cart below. Pick up at farm is also available.